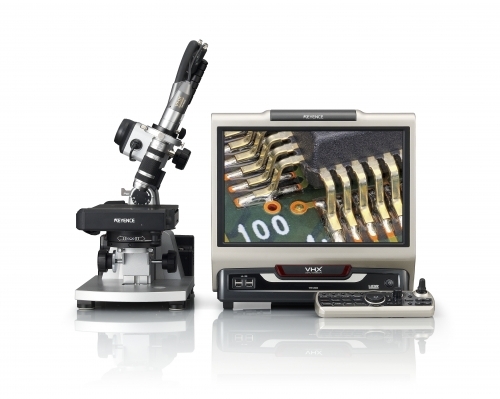 Digital microscopy manufacturer, Keyence has released its latest microscope system, the VHX-2000. The VHX Series Digital Microscope was designed to alleviate the shortcomings of traditional, optical light microscopes - shallow depth-of-field, short working distance, lack of portability and versatility, sample limitations, etc. By integrating advanced zoom optics with a CCD camera, 17-in LCD monitor, light source, controller and analysis/reporting software, the VHX streamlines testing and improves the speed and efficiency of the inspection process. With a magnification range from 0.1x - 5000x, the VHX Series enables a wide range of microscopic observation from macro-scale stereoscopic imaging to the detailed analysis of an SEM. Many lighting techniques are also supported including bright and dark field, transmitted, polarized, and differential interference observation. Building on top of the VHX platform, the VHX-2000 incorporates several new features. A colour filter wheel has been added to allow users the option of choosing a specific wavelength (red, green or blue) of light for their samples. A Super Resolution mode combines the blue filter with Keyence’s pixel shift technology, capturing images with 25 per cent better resolution. To improve the operation and ease-of-use, the VHX-2000 can be equipped with a motorised XY stage along with motorised Z-axis lens control. Users can adjust movement in all three axes by using an included control pad. When combined with our Double’R lens/magnification recognition function, the VHX-2000 can automatically provide the ideal movement speed for the XY stage and enables one-push automatic focus and calibration. The Image Stitching function can now be completed with just the push of a button, and at much higher speeds, to produce up to a 20,000 x 20,000 pixel image that expands the viewing area by up to 200 times. Automated measurement functions simplify the most difficult of measurement tasks and help to remove variation between different users. The system also has the ability to save a portion of the image/measurements as a template to be used to measure future samples with a click of the mouse.